It’s National Arbour Week on 3–9 September 2018 and we’re celebrating the importance of trees. Among many other benefits, trees help filter contaminants in the air and lower greenhouse gases, reduce urban runoff, lower noise pollution, increase the enjoyability of living spaces, provide shade during summer and naturally help to keep your home cool. Choose your favourite and follow our guide to caring for your new tree sapling. Consider your needs: do you want evergreen foliage, shade or a tree that will attract birds to your garden? Look for a sapling that is free of any pests or fungal diseases. Choose a shorter tree with sturdy lower branches over tall, spindly saplings – it will be less likely to topple over once you plant it. Avoid picking it up by the trunk and provide some barrier protection when transporting it so that it doesn’t get ‘wind burn’. Your sapling will have its own special light requirements, so make sure to check that the spot you choose in your garden is shaded to the appropriate height. A shaded area of dirt is not necessarily shaded a metre up. Check that the light levels will be correct at the top of the tree by using a broomstick placed vertically on the desired location, seeing how high the shadow mark extends up the stick at varying points during the day. Dig a 60 x 60cm hole. The large hole will ensure there is enough new, loose soil for young roots to easily grow into, and will also encourage faster and healthier growth. A square-shaped hole encourages roots to grow sideways and downward for a large spread of deep roots that will ensure the stability and rigidity of your newly planted tree. Plant the tree at the same depth as it was in its packaging. Mix two handfuls of compost, half a cup of bonemeal and half a cup of 2:3:2 fertiliser into the dug up soil. Fill the hole with water and allow it to soak in and drain naturally. Backfill around the root ball, lightly packing the soil as you go. Remember to tightly pack soil only directly around the stem – roots need loose soil further from the sapling to grow into. Any leftover soil can be used to form a watering well: a small mound of soil around the tree. To help save water and prevent rapid drying of soil around the tree, cover the soil with a 7–10cm layer of mulch that should extend 45cm around the trunk in a circle. Although your tree is at its weakest just after planting and needs a fair amount of water, be careful not to overwater the sapling. During the first two years, the soil should always be moist, not soggy. Insert a garden spade into the soil around your sapling to a depth of 3cm to make a small trench, then feel the soil. If it is dry to the touch, your sapling needs water. If it is moist, it is fine. If in need, water your tree with a steady stream from a garden hose for 30 seconds. 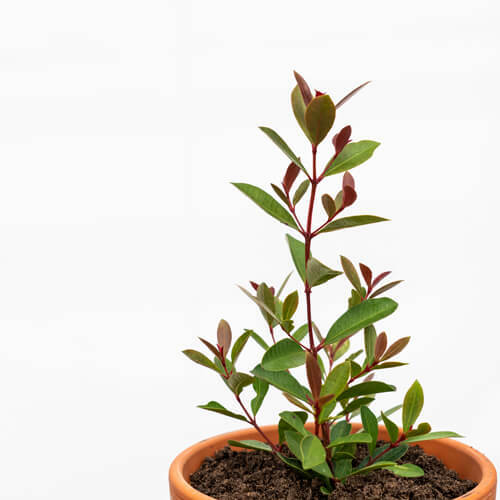 After your tree has been established in the garden for more than two years, it will have developed a strong root structure and can withstand longer periods without water. You will most likely not need to water it. Deep watering ensures the sapling’s roots grow strong and deep underground. A light and insufficient watering will cause surface roots to develop. These are too weak to support the young tree and can make the plant susceptible to disease. Remember that sprinklers do not adequately water tree saplings and actively contribute to surface root formation.